Summary: Provides a brief biography on the life and accomplishments of the scientist Dmitry Mendeleev, who created the periodic table of elements. Known as one of the greatest chemists to ever live, Dmitry Mendeleev made many significant contributions to chemistry during his life (1834-1907) but most importantly, he is the father of the periodic table of elements. He began college at the University of St.Petersburg but then switched to the University of Heidelberg in 1859. At Heidelberg, Mendeleev met an Italian chemist named Stanislao Cannizzaro. Together they worked and shared ideas and Cannizzaro provided the inspiration about atomic weight that led Mendeleev to his creative ideas. Also influenced by the discoveries of John Dalton and his work with atoms and how they worked, Mendeleev was able to sort together his ideas and think on a higher level. 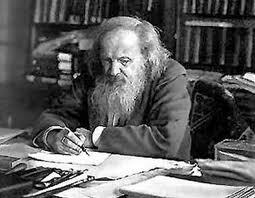 In 1863, Mendeleev returned to St.Petersburg and became a professor. He went on to become a renowned teacher and highly respected in the field of chemistry. Without a sufficient textbook to guide him, Mendeleev thought to make his own. Between the years of 1868 and 1870, Mendeleev worked on a 2-volume book called The Principles of Chemistry. It was a compilation of all the things he had learned and acquired throughout his studies and teachings, and it later went on to become a classic. His goal was to classify elements according to their chemical properties. With this information and through further studies, Mendeleev proposed the need for an organization tool, which housed all of the known elements. In 1869, Mendeleev published the first table in which he arranged all of the known chemical elements based on atomic weight. It was said that, "elements show periodicity of properties when they are arranged according to atomic weight." In 1871 he published a more updated version, however still leaving space for unknown elements that would later fill in the gaps. Also in his studies, Mendeleev is known to have done research in the topics of the study of chemical theory of solution, the nature of petroleum, and the thermal expansion of liquids; all of which he was profoundly familiar with. Din 1890, Mendeleev resigned from his post as a professor and three years later went to work as the director of the Bureau of Weights and Measures in St.Petersburg. He held that position until his death in 1907. Mendeleev did profound work in the field of chemistry and the organization of elements and will forever be remembered as the father of the Periodic Table. It is still used today as one of the most helpful tools in science. Without it, most chemists, and students, would be lost.